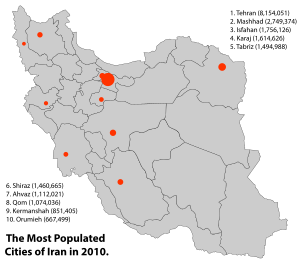 This is a list of cities in Iran, categorized by province. 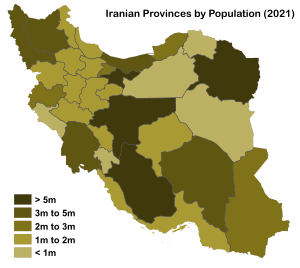 The census years listed below comes from the Statistical Center of Iran; since the year 2006 the country of Iran has had a census every 5 years. The cities that are bold are capitals of provinces, counties & districts. 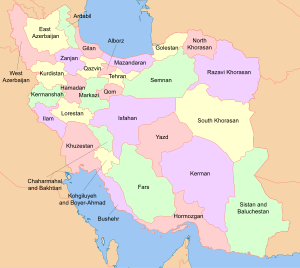 Iran has 31 provinces and 1245 cities. ^ "National Census Preliminary Results Released: Iran's Urban Population Up". Financial Tribune. 2017-03-13. Retrieved 2017-05-28. 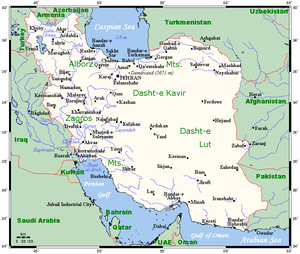 ^ The former villages Darvishabad, Gavmishabad, Gondamakar, Hadiabad, Khazami, Kut-e Abdollah, Kut-e Navaser, Kuy-e Montazeri & Shariati-ye Yek merged on January 23, 2013 to create the city of Kut-e Abdollah. ^ The former villages Ablesh, Chahardahi-ye Asgar, Chahardahi-ye Sohrab, Deh-e Ebrahim, Masiri & Tall Kohneh merged in 2006 to create the city Tashan. ^ The villages of Bavers & Zibashahr merged to create Mohammadiyeh. ^ The former villages of Shemshak-e Bala; Shemshak-e Pain; Darband Sar; Sefidestan; Darrud & Jirud merged together to create the city of Shemshak. Chaichian, Mohammad A. (2009). Town and Country in the Middle East: Iran and Egypt in the Transition to Globalization. New York: Lexington Books. ISBN 978-0-7391-2677-6. This page was last edited on 13 April 2019, at 11:00 (UTC).